In 2014, the Irish American Archives Society dedicated a bronze sculpture by Dublin-based and internationally known artist Rowan Gillespie. The sculpture commemorates boxer Johnny Kilbane, who held the world featherweight title for an unprecedented 10 years from 1912 through 1923. Born in Cleveland to an Irish-born father, Kilbane exemplifies a Cleveland, immigrant success story. The sculpture, "Fighting Heart," stands in a park at the corner of West 75th Street and Fr. 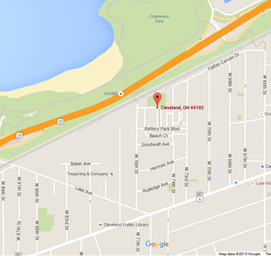 Frascati Boulevard in the Battery Park Development within the larger Detroit-Shoreway neighborhood on Cleveland's west-side. The sculpture was commissioned by the Irish American Archives Society with the support of numerous individual donors. Sculptor Gillespie received the commission on the basis of celebrated work in other cities of the Irish diaspora: The Famine group on the quays of Dublin, The Titanica in front of the Titanic museum in Belfast, Migrants in Toronto's Ireland Park, and The Laureates in the Burns Library at Boston College. Fighting Heart depicts Johnny Kilbane at three phases of his life: as an impoverished boy living in Cleveland's Angle neighborhood, as a world champion, and as an older public servant who served in the Ohio state legislature and as Clerk of Courts. Click the map on the right for directions to the "Fighting Heart" sculpture. To view a six-part series of short videos on Rowan Gillespie's process for the development and making of Fighting Heart, click here. 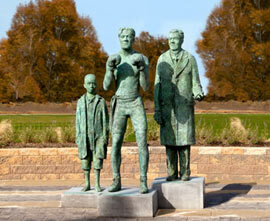 For teacher resources materials providing background information about Johnny Kilbane, boxing in Cleveland, the neighborhoods that Johnny Kilbane lived in, and the making of the sculpture, click here. The short videos about the making of the sculpture and the teacher resource materials were produced with the support of the citizens of Cuyahoga County through a grant from Cuyahoga Arts and Culture.